Walker’s Legacy Foundation has graduated 52 participants through its Moms Who Hustle program. The 12-week program is specifically designed for enterprising, millennial women of color, between the ages of 21 to 35 years old who have entrepreneurial aspirations, and are looking to take their businesses to the next level. The graduates are now equipped with the tools and resources needed to financially plan for their entrepreneurial futures. The program has locations all over the country in four major markets: Baltimore, Maryland; Detroit, Michigan; Washington, DC; and Newark, New Jersey. This unique opportunity allowed participants to gain financial knowledge, while still accommodating their everyday lifestyles. For example, the program employs a “one-week-on/one-week-off” curriculum where classes will be scheduled on-site every other week and via the new Walker’s Legacy Foundation e-learning mobile app the next. In addition, all on-site classes provided free childcare. Research has shown that 39% of the more than 10 million low-income working families with children are headed by single working mothers. Whether it be the beautician working out of her house, the woman maintaining her online boutique, or the caterer cooking from her own kitchen, these Moms Who Hustle are the new faces of entrepreneurship. Upon completion of the program, 87% of all program participants agreed they felt more confident 54% felt confident that they could now network with new people, which was a significant improvement over pre-program assessment responses. As it relates to communication, 46% felt they could confidently deliver an elevator pitch about their business within 30-seconds or less as compared to 13% starting out. By the completion of the 12-week program, 63% had completed formal business plans. When asked about finances post-program, 82% of participants had a savings account separate from their checking account which was a 30% improvement from pre-program assessment. Additionally, 48% felt more comfortable with using budgets and roughly 40% felt confident they could handle financial emergencies as they arise because they had started to save. Lastly, 50% of participants post-programming felt confident they could scale their business with what they learned. Moms Who Hustle participants were mothers with dynamic ideas, talents, or crafts that cultivated the have the potential to flourish as a business. My experience attending Moms Who Hustle was life changing for me and my boys. It built my confidence, unmasked my potential, and it put me into a network where I am mentored by some of the best, confident, female minority entrepreneurs in the world. My son often traveled with me to Detroit, and thus this became a family endeavor. Witnessing my commitment to pursuing training that would help me accomplish my dreams, inspired my sons to want to become entrepreneurs themselves. It was a privilege to attend a program that exhibited a high level of professionalism, and from instructors that I could identify with. The training atmosphere was outstanding, supportive, positive, and innovative. “When I came across Walker Legacy Foundation: Moms Who Hustle, the name itself intrigued me. I knew for me to manifest MommyMay into the growth that I envisioned for it, Moms Who Hustle I believed offered the opportunity I was looking for. Moms Who Hustle provided a program that offers financial literacy and entrepreneurship two factors which is key to building any successful business. MommyMay is a digital platform where I, a lifestyle mom blogger encourage families to create memorable moments with their child(ren). I share recipes, craft ideas and travel recaps of her everyday life with her son Tristyn. Moms Who Hustle has granted me a clear-cut path and an opportunity for growth. 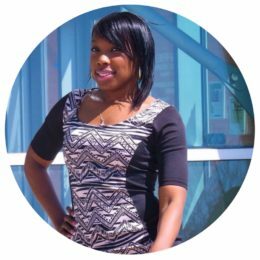 The young woman in the Newark Community will benefit from Moms Who Hustle for many reasons. The program offers a positive and comfortable environment where you learn not only from your instructor, but also from your peers. They offer child care for those parents who have children an added incentive to commit to attending classes. I believe that in order to keep the Newark culture alive and growing, young women need the tools to become financially literate, learn how to build a brand, establish personal and business relationships, network, and create income for themselves. Programs like Moms Who Hustle make all the above possible. I love teaching, writing, and working for myself, but numbers used to give me anxiety and overwhelm. For two years, I had been looking at other entrepreneurship programs. Either I couldn’t afford the tuition, I didn’t have childcare, or I didn’t feel that I fit in. (After applying to one program, the coordinator called and asked me to bring my husband to the entrance interview.) Somehow the universe led me to a blog post about Moms Who Hustle, and I just knew that my prayers had been answered. Moms Who Hustle has completely transformed my mindset about money, and has given me an incredible sense of community. The program’s action items have shown me that I really am the one controlling my finances, instead of my finances controlling me! The women in our group inspire me with their journeys and support; our group is not just a business community of women crushing our goals (although it is that), but also an incredible experience of love and positivity. As a former education researcher here, I know that more than half of Newark’s school children live with single moms and that most of us are struggling. From oppressive racial inequity to the gender wage gap, our current economic system is set up to keep single moms struggling. Moms Who Hustle is giving us amazing tools to transcend the struggling. We are building credit, managing budgets, and creating start-ups. We are building empires. We are changing norms. We are rising up. We are teaching our children that in Newark or anywhere, we can create the life of our dreams. Co-owner alongside my sister Jessica Borgella of li.ai.son, an online boutique, we are relatively new entrepreneurs (on paper) who gained a love for fashion in our younger years and despite the whirlwinds of life, we’ve been able to watch our passion grow and have just recently opened for business. The concept of li.ai.son is where urban and vintage cultures meet. We started “thrifting” as young adults when we didn’t have much money to buy designer label clothes but as we continued found that there is such a mystical richness behind vintage clothing. We have mastered a way of reviving the old but making it hip and stylish so that our peers can appreciate it too. When I came across Moms Who Hustle, it peaked my interest instantaneously. I knew this was a project I absolutely had to be a part of as I am the quintessential hustling mom. Working a full time, a part-time job, and being an entrepreneur while raising two children, I have found that you have to be an ultimate creative and mastermind. To balance all these major responsibilities efficiently has forced me to be nothing short of a hustler. There are so many things that I have learned and still have left to learn and what better way than to surround myself with like-minded individuals that can guide me along the way. This is the village that raises the child. Communities everywhere and especially urban communities like Newark need groups like Moms Who Hustle. Women that need the program are from all walks of life with the same story. A story of strength beyond measure. A story of undeniable love and care for our most prized possessions, our children. And a story of hope and passion that will defy all odds and journey with us into our greatness. We are moms that hustle and we won’t be stopped. The Walker’s Legacy Foundation mission is to provide a foundation of entrepreneurial, financial and professional support to improve the livelihood and economic equality of women. The Who Enterprise Programs and the University Women Programs focus on the mission of Walker’s Legacy Foundation and are part of our current strategic plan and addresses programming for 2017 through 2019. Our goal is to maintain these programs and to continuously seek partnerships with organizations, government entities, and companies to consistently provide programming to support the mission of Walker’s Legacy Foundation. Moms Who Hustle is taking on a new name and brand to be apart of our Who Enterprise programming as Moms Who Enterprise. Read about our Moms Who Enterprise programming in Washington DC here. The accelorated 2 week program awarded $5,000 in micro-grants to its DC cohort of low-income millennial single mothers. Supplemental partners include the W. K. Kellogg Foundation, Washington Regional Association of Grantmakers, Coca-Cola, Google, IBM, DCPNI, DC Department of Employment Services, and the Newark Community Economic Development Corporation. Through Walker’s Legacy Foundation and its partners, collaboration occurs to deliver beneficial skills and supports to participants which thereby help various communities thrive and improve.